Saturday 10 October 2015, 7:30-9pm. Just 24 hours after my CIADA presentation in Singapore, I will present a public lecture on behalf of ISRA (Islamic Sciences Research Academy), hosted by my colleagues from Charles Sturt University’s CISAC (Centre for Islamic Studies and Civilization). Please click on the image for more information, and feel free to distribute this flyer. 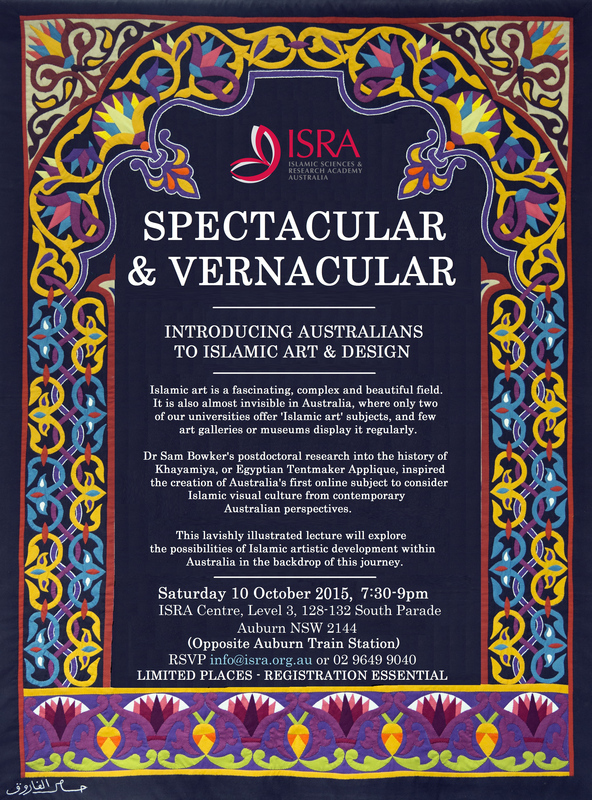 Reservations are required and can be made via info@isra.org.au or (02) 9649 9040. This public lecture is an expansion of my presentation for CIADA. It contains additional references to case studies and assessment items from ART240 and specifically Australian tertiary contexts, as well as more background regarding my own work in the field of Islamic art for Charles Sturt University.